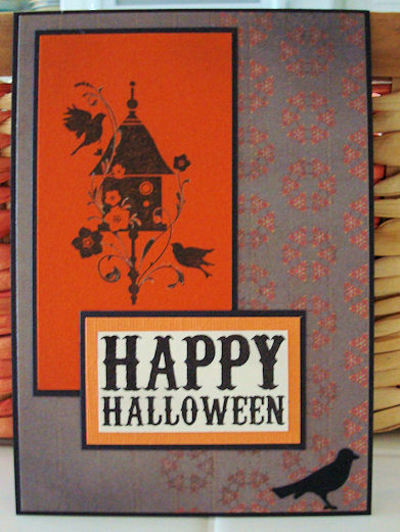 This is a simple card, yet it is one of my favorites I've made lately. 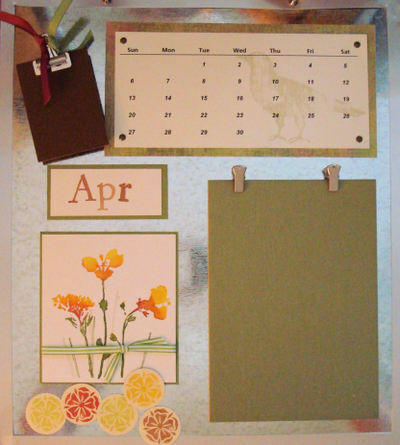 The background paper is from Memory Box. 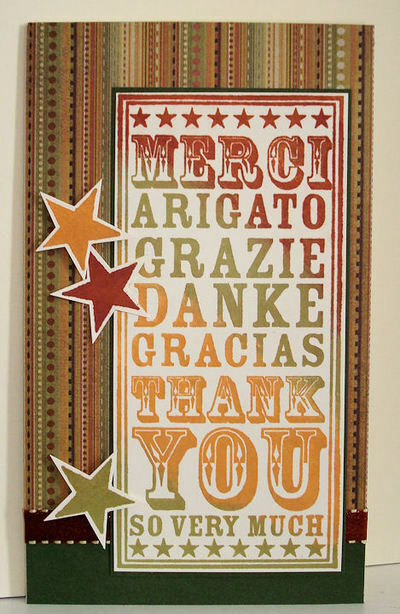 The Thank You Notebook stamp is a new stamp design from Purple Onion Designs. The star stamp is also from POD. I used chalk inks. I love to use these as they blend so nicely. 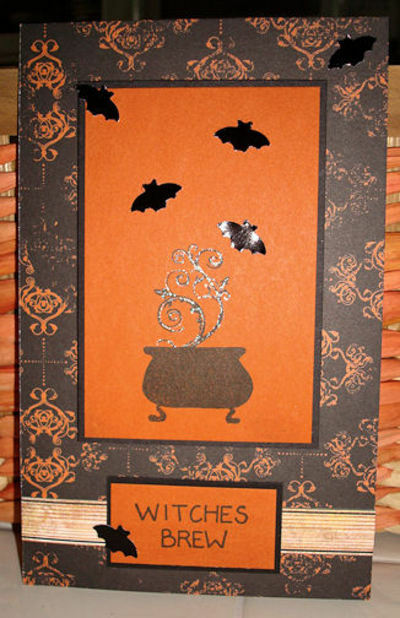 Here are just a few Halloween cards that I started before I left on vacation. I finally got back to them yesterday to finish them. 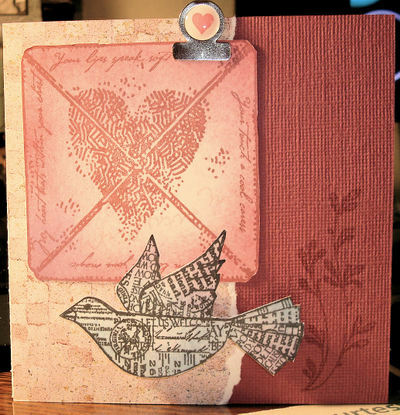 The first card is using one of Michele's new "noteblock" stamps from Purple Onion Designs. Love this stamp. It is so versatile. You can use as shown, or punch/cut specific words or portions of the image out. And, I still love her stamps too, because they are still good old red rubber!!!! Check out all of her new stamps!!! 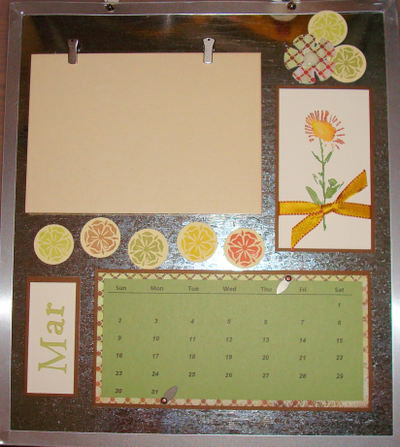 This uses Basic Grey Ambrosia printed paper. Also, the crow stamp is from Stampabilities; the cauldron from Impress; birdhouse from Inkadinkadoo. 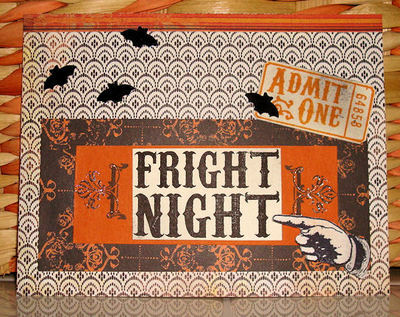 Cut the words "fright night" from the same stamped image. Ticket, brackets, and hand are also from Purple Onion. 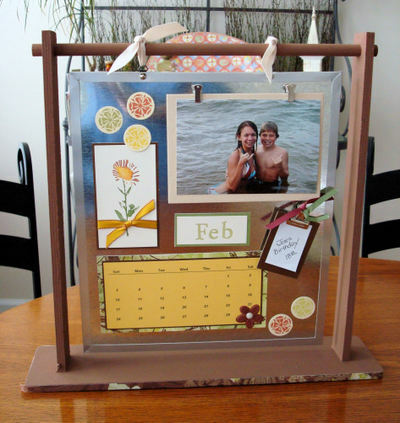 BG Ambrosia and Making Memories paper. 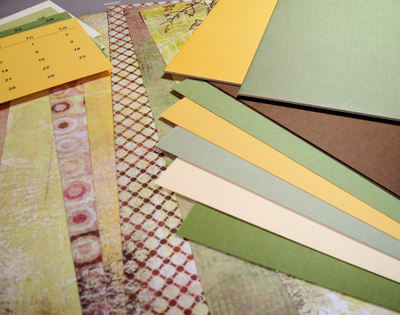 Printed paper from Memory Box... the paper is gorgeous. 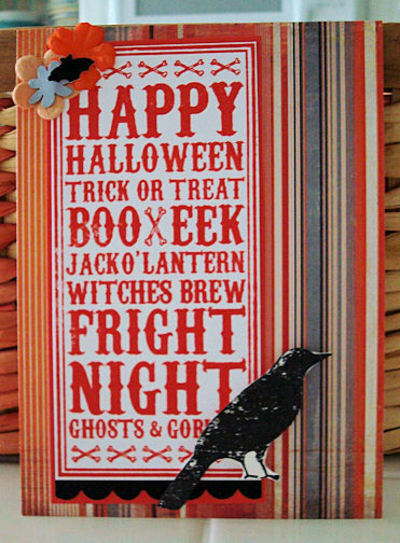 Again, words cut from the original Purple Onion Halloween stamp. 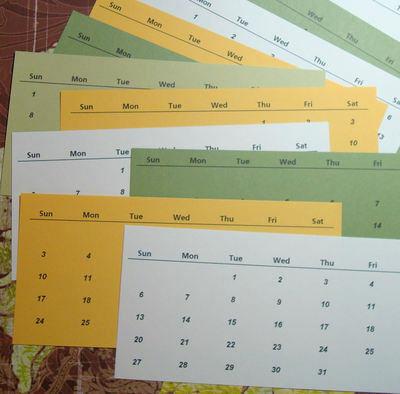 Printed paper is BG Ambrosia. Background paper is Making Memories. 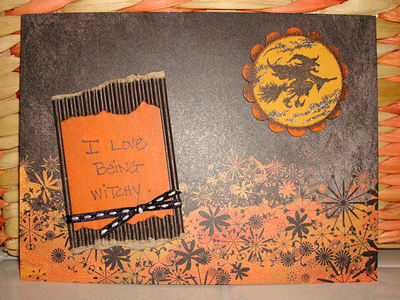 Words cut from POD Halloween stamp. 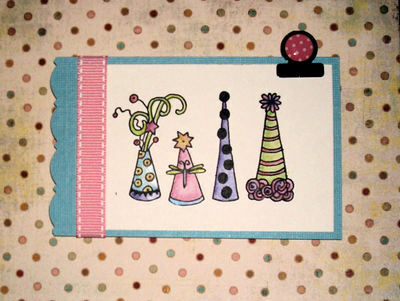 A tall, skinny card with Making Memories Background paper. The vapors on the cauldron are highlighted with a glitter pen. Shows up more in this picture than in real life. Hope all of you are having a pleasant Easter weekend. I didn't have any special new Easter cards to share, so I pulled this carrot tag from my art vault. 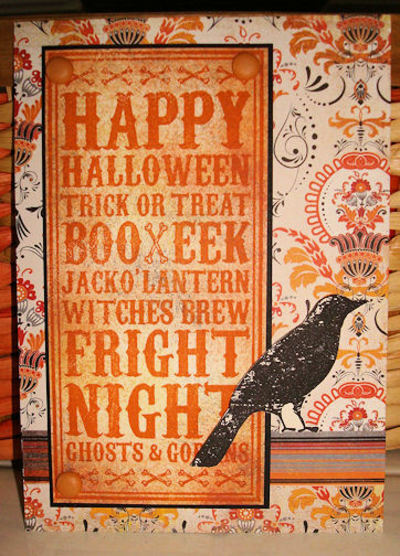 All torn layers of textured paper, chalked edges, and the sentiment is from Purple Onion Designs. Recently,I was in a Easter Banner mingle. We each had to make one triangular "banner" with an Easter theme. This is what I made. I don't do "cute" too often, but thought this was a perfect theme to explore my "cuteness". I took lavendar cardstock and cut the banner out. I used a printed paper from Memory Box for the background. The bunny was stamped on the lavendar cardstock and cut out. I softly colored her with PrismaColor pencils. 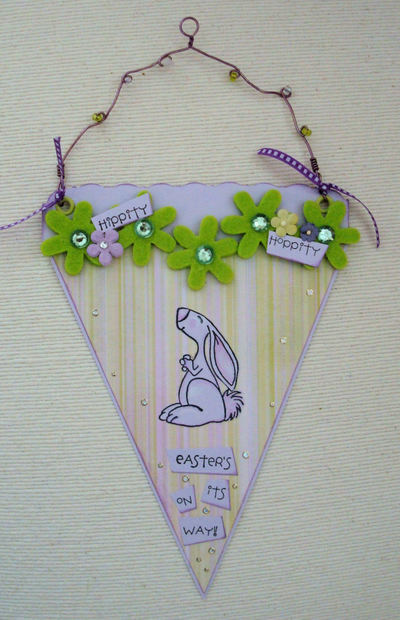 The "hippity hoppity" saying is from Purple Onion Designs. Just added bling, felt flowers, paper flowers, ribbon, and a wire hanger with beads. Hippity Hoppity, Easter is on it's way!!! Valentines Day is just a week away. Here are two cards that I made for friends. Both cards are made with two stamps from Stampers Anonymous. I recently discovered this bird stamp. It has actually been around for some time now, but I just came across it. I'm not sure where I have been all this time?!?!? 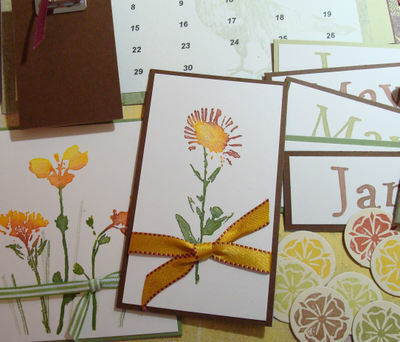 The flourish used on the first card is from Purple Onion Designs. The images were stamped and colored by stippling with chalk inks. I cut the images out and mounted on background paper. The birds are on pop dots for dimension. I must say that I love the background paper used in the second card. This picture does not do it justice. 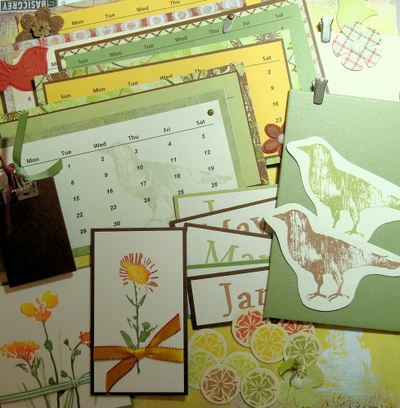 It is from the new "Sprout" collection from Memory Box. It is gorgeous. Their paper is so nice and heavy. I highly recommend it. This was just a quick little birthday card that I made for my friend Michele... the owner of Purple Onion Designs. I colored it with Prismacolor pencils and Sansodor. I do hope that she had a happy birthday. Update - The stamp used for this card is from Paula Best. 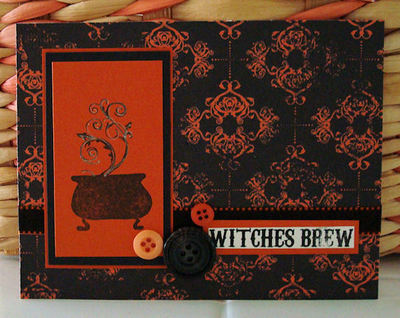 Here is a sweet ATC I made. I used a torn piece of Jenni Bowlin paper. I colored in the bird and blossoms. 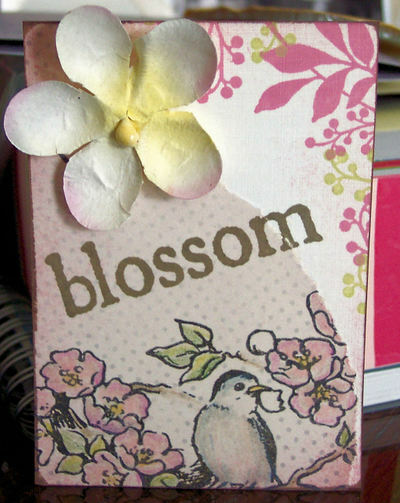 The "blossom" stamp is from Purple Onion Designs. The background stamp is from Magenta. Flower is from Prima. 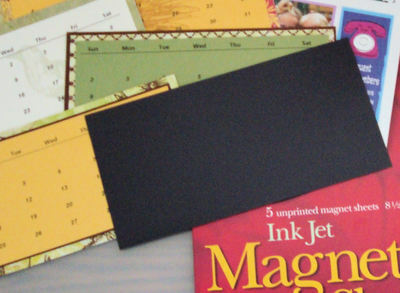 Edges are stippled with chalk inks. This is an accordian tag that I made for one of my online art groups monthly "art lottery". 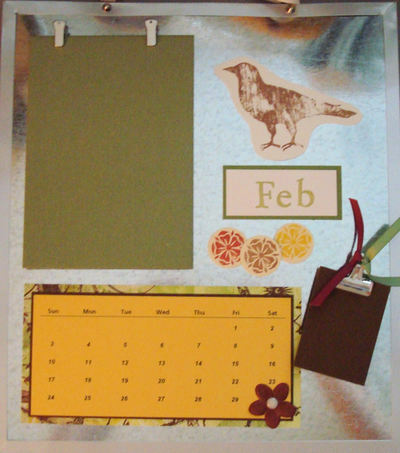 Each month there is a theme....this month it is "birds". 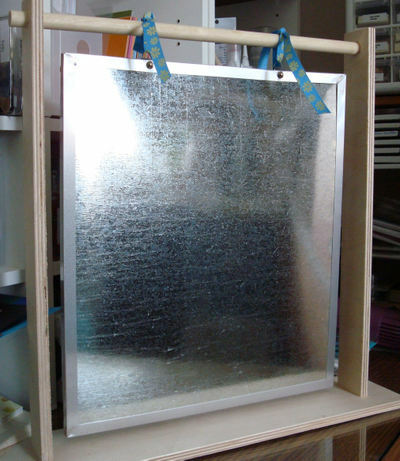 Anyone in the group who wants to join can enter a piece of art into the lottery. At the end of the month, a name is drawn and that person gets all of the art submitted to the lottery. It is a fun idea. I won last months projects. They were Christmas themed. I received a variety of art... ornaments, mini books, exploding boxes, etc. Loved it all. For this tag, I took a piece of Basic Grey printed paper and cut it to a 9" x 6" size. Using my Scor It, I was easily able to put in the folds of the tag (handy tool to have around). 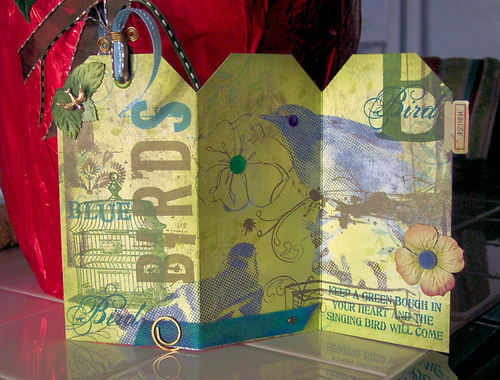 The paper had the two blue birds on it already, but I stamped it with words, images and background stamps. 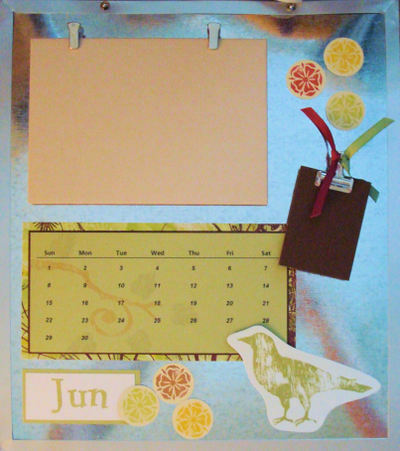 I used Purple Onion Designs Downcome and Ancient Page alphabets for the word "blue" and "birds". The birdcage, big letter "B", script bird, and sentiment are all from Oxford Impressions. 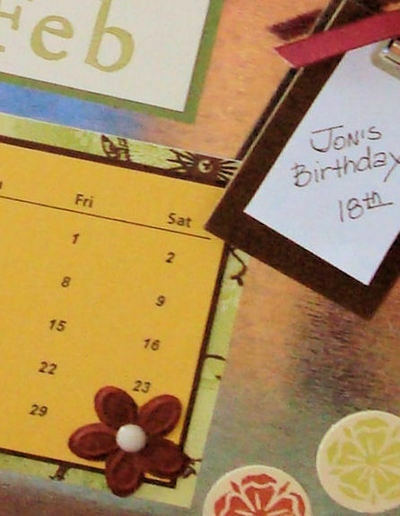 There are flourishes and musical notes stamped in the background. I finished off the tag by stippling the edges. I used shades of olive, moss and blue chalk inks. Embellishments include Prima leaves, bird charm, 7gypsies tab, prima flower, MM velvet brad, chipiola clip, hand dyed twill, ribbons, and sequins for the birds eye and flower center.